For the millefeuille, roll the pastry out to 8mm/1/3in thick and cut into two 28cm x 10cm/11in x 4in rectangles. Place the pastry rectangles onto a baking tray and dust with the icing sugar. Bake the pastry in the oven for 15 minutes, or until golden-brown and well risen. Remove from the oven and set aside to cool. 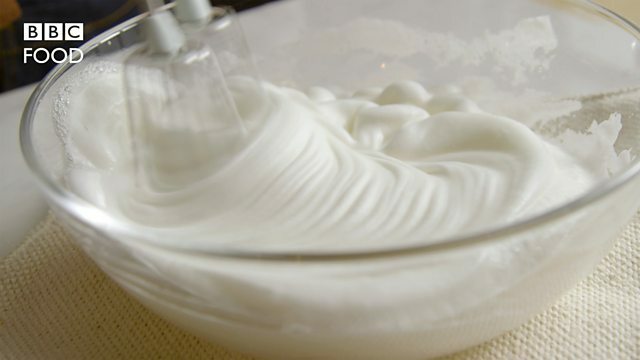 Whisk the double cream in a large bowl until soft peaks form when the whisk is removed. Add the vanilla seeds and caster sugar and whisk until stiff peaks form when the whisk is removed. Set aside. For the raspberry sauce, place the raspberries and lemon juice into a food processor and blend to a smooth purée. Taste the mixture and add icing sugar, to taste. Pass the mixture through a fine sieve into a bowl. To serve, split both pieces of pastry in half widthways to make four pieces of pastry. Place one piece in the centre of a serving plate and spoon over a third of the whipped cream, smoothing out the top. Arrange a quarter of the fresh raspberries on top of the cream, then top with another sheet of pastry. Repeat the layering process by topping the second sheet of pastry with half of the remaining cream and some more raspberries. For the final layer, top the last piece of pastry with the remaining raspberries and dust with icing sugar. Carefully slice into 6-8 portions and serve each slice of millefeuille in a pool of the raspberry sauce.